Here's an oddity: one of the most uniquely Japanese of daikaiju eiga variants, Ultraman, but this time made in Australia largely by Australians and featuring Australian actors -- all under the auspices of Tsuburaya Productions. 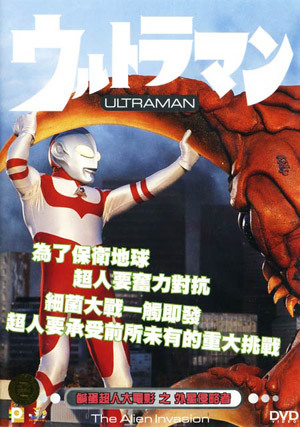 Ultraman: The Alien Invasion is an edited-together version of the Japan/Australian TV series generally known as Ultraman: Towards the Future. Filmed downunder, this series was never aired in its country of origin, though it did receive a run on US television and, of course, in Japan, and is generally considered to be a valid part of Ultra-history, its Ultraman appearing in on-stage shows and the like. What is odd, however, is seeing some very Japanese-kaiju-style events taking place in a familiar Australian context with Caucasian actors, and with dialogue delivered in an Australian accent. 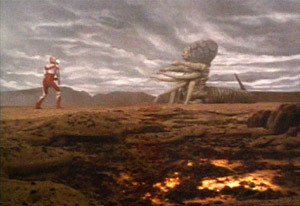 Apparently Ultraman: The Alien Invasion incorporates material from episodes 1, 2, 3, 5 and 6, and, I must say, does a surprisingly good job of converting them into a coherent storyline. Apart from one obviously overzealous scene jump, its episodic nature is hidden behind a developing tale of alien invasion and leads to a satisfyingly climactic third-act confrontation. The story begins on Mars, with redundant narration intended to ease us into the proceedings, supplied by none other than Gus Mercurio (of Turkey Shoot, The New Adventures of Flipper and Doing Time for Patsy Cline, among other things). 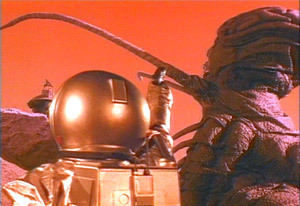 The first two Earth astronauts to land on the red planet (and here it is almost surreally red) find themselves witnesses to a titanic struggle between a huge tentacled monstrosity (Goudis) and Ultraman. Unfortunately they soon find themselves more than mere spectators; one is killed when their Mars probe gets whacked, while the other is left stranded. This latter, Jack Shindo, later appears back on Earth, much to the bemusement of his colleagues -- only now, unbeknown to them, he is able to channel Ultraman. 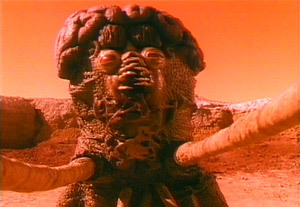 This proves useful, as the annihilation of Goudis on Mars has caused the kaiju's lifeforce to journey to Earth in the form of a virus that creates monsters of any living matter it encounters. Terran life is, as a result, under threat of being totally subsumed by Goudis and his monstrous shadow forms. Various weird kaiju rampage, buildings crumble, Jack becomes Ultraman and fights the monsters, divisions appear in the military ranks and events escalate toward the re-incarnation of Goudis itself. This climax comes with a final battle on the outback plains of Australia, where the desolation is evocative of the Martian landscape where it all began. With good effects, decent actors and reasonably controlled dramatic pacing (all things considered), Ultraman: The Alien Invasion transcends its origins as a TV-series compilation and proves to be an exciting and subtly different Ultraman adventure. "The Ultraman Series was made in association with the South Australian Film Corporation, with the assistance of SAFIAC -- ADELAIDE"
© 1990 Tsuburaya Productions Co. Ltd.